As often happens, I didn’t think things through before requesting a title for review. 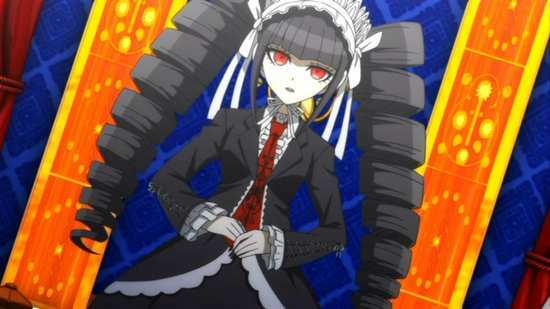 But there was a special reason that I wanted to review Danganronpa, one which had nothing to do with the actual title. You see, this might just be the last new Manga Entertainment title that we see in the foreseeable future. Things have been well and truly shaken up there in the last twelve months, with former employees Jerome Mazandarani and Andrew Hewson setting up their own Animatsu anime label, an exclusive arrangement with Funimation coming to an end, and also being sold by parent company Starz. At the time of writing, Manga and Platform (formerly Anchor Bay) are now their own entity, while the process of merging with Animatsu is now complete. But the state of play at the last MCM Comicon was that all the new license announcements were made on the Animatsu label. And while Manga still distribute for themselves, Animatsu and Kazé, they had no new licenses at all. It seems at this time that the Manga Entertainment brand exists to curate their back catalogue, and continue releasing ongoing titles in existing, established Manga brands, such as Naruto, One Piece, Ghost in the Shell, and Evangelion. As for new titles... it seems that Danganronpa is the last one. Then I read the blurb on the back of the case. Fifteen kids in school can never leave until they murder one of their number. It’s Battle Royale again! Death games as entertainment have been a thing since the gladiators of ancient Rome, and entertainment about such things is almost as old. We’ve had The Running Man, the Saw franchise, plenty of films where people are forced by external agencies to fight to the death against each other for someone else’s enjoyment, but it was the Japanese with Battle Royale who put teenagers into that predicament. It took its time but the floodgates have finally opened in the west with movies like The Hunger Games and Maze Runner. Such stories abound in anime too, with Btooom! 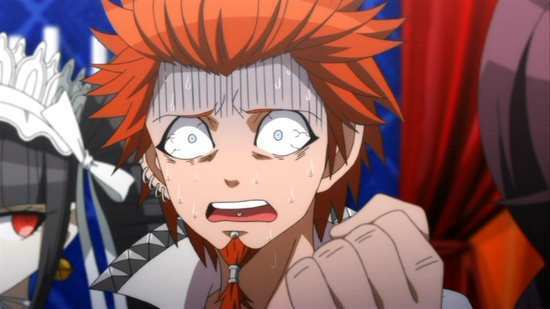 and Deadman Wonderland two recent examples, so Danganronpa seemed tired and clichéd before I even started watching it. And I haven’t even mentioned that it’s based on a videogame! But then again, it’s not that you’re telling the same story again, it’s how you tell it that matters. Makoto Naegi thinks he’s got it made. He’s just won a lottery. Not the kind that gives cash, but the kind that guarantees a future, or so he thinks. 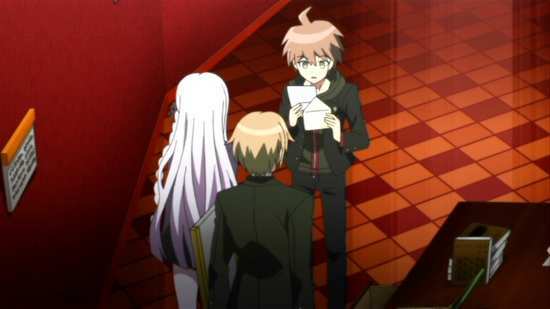 He’s just got a letter offering him a scholarship into the elite Hope’s Peak High School, a government sponsored Academy that tutors the best of the best, those that will become the shining lights of the nation upon graduation. Only when he steps over the threshold, he’s leaving his life behind in a more literal sense. This school is less about hope, and more about despair. He’s sealed in there with no way out, one of fifteen rather oddball students, hardly the elite, and there are no teachers, no lessons. There is a black and white robot bear though, named Monokuma, and Monokuma tells them that the only way to graduate this school is to commit murder and to get away with it, either that or die. 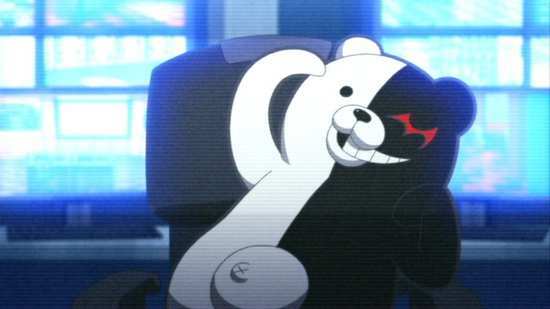 The bear has an elaborate game planned, murders to be followed by investigations and trials, and the students get to be judge and jury, victims and criminals, although Monokuma will keep the position of executioner for himself. On top of that, breaking the school rules results in capital punishment too. That’s not the kind of game that any sane person would play, but Monokuma offers the students incentive in that regard as well. 6. (Not) Normal Arc: Return of the New Century Galaxy Legend! O Armored Hero, Stand Upon the Earth! 7. Not Normal Arc: Return of the New Century Galaxy Legend! O Armored Hero, Stand Upon the Earth! What does Danganronpa have in common with Star Trek VI: The Undiscovered Country? 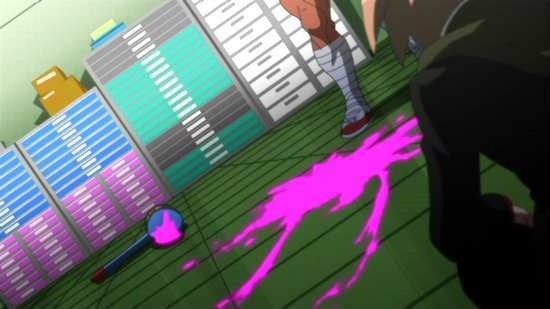 The blood is bright pink in both to save broadcaster/censor sensibilities. Danganronpa gets a 1.78:1 anamorphic NTSC transfer on these discs, and the show is progressively encoded. The image is clear and sharp throughout, with strong bright colours (particularly the neon pink), and the playback proceeds with no obvious issues such as compression or aliasing. 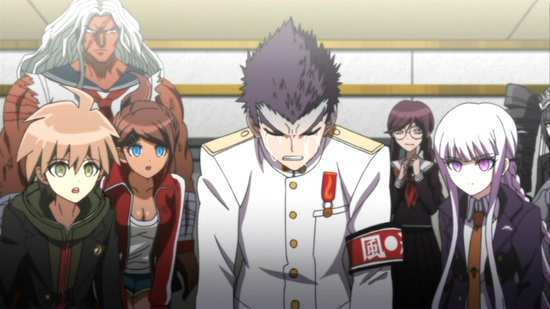 Danganronpa really is a striking animation. The character designs are extremes of their character stereotypes. The main character is the usual ineffectual teen male, so he’s short and mousy. The biker is the uber-biker; the butch wrestling chick looks like something out of Fist of the North Star, the nerd is obese, with greasy hair and thick glasses, and so on and so forth. It’s all pushing things just beyond the limit, but it works well. The world design, this particular death school comes across with impact, while the animation style will switch for each execution sequence, getting even more stylised, almost like 2D puppetry. 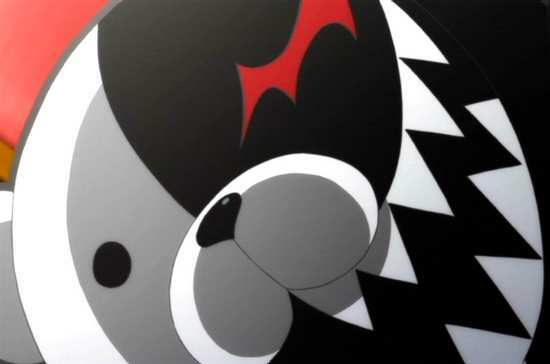 As for Monokuma, the evil bear proxy at the heart of the nightmare, now we know what Pudsey Bear is actually like beneath the eye-patch. 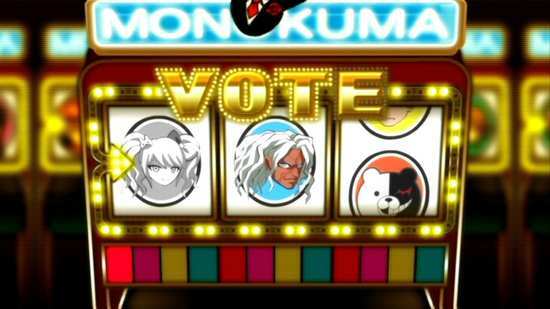 Danganronpa offers the choice between DD 2.0 English and Japanese, with optional subtitles and a signs only track. There are no problems with the audio, the dialogue is clear throughout, the music suits the tone of the story well, and the action gets fair presentation in the stereo format. The subtitles are accurately timed and free of typos, although this may be one of the shows where pause gets a fair bit of use for the sake of on screen text captions. I gave the dub a try to ensure that it exists, and I wasn’t compelled to switch it off during the minute or so that I gave it, so it can’t be bad. These appear to simply be the Funimation discs recoded for Region 2, no Manga logo at all. The discs present their contents with static menus and jacket pictures, with each episode getting a couple of pages of translated credits after they end. There aren’t any next episode previews though. Disc 1 autoplays a trailer for Future Diary (soon to be released here as Mirai Nikki). 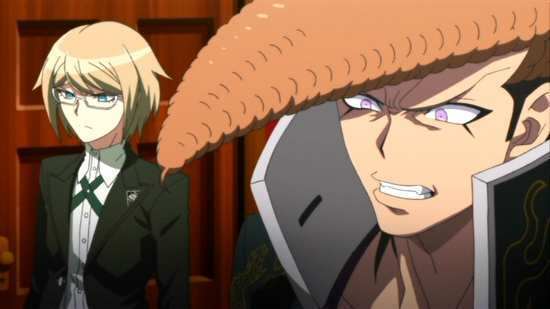 The only extra is the typical Funimation audio commentary on episode 1, with ADR Director and voice of Hagakure, Christopher Bevins, Bryce Papenbrook (Naegi), Felecia Angelle (Asahina), and Tyson Rinehart (Yamada). Note that this contains spoilers for the entire series. Disc 2 autoplays with a trailer for Tokyo Ghoul, and you’ll also find the US trailer for Danganronpa, and further trailers for Riddle Story of Devil, Deadman Wonderland, Noein, Eden of the East, Black Lagoon, and Buddy Complex. You’ll also find the two textless openings and three textless endings. Danganronpa is apparently based on a PS Vita videogame, hence the qualifier of “The Animation” in the title. Since I’ve long since given up twiddling my thumbs for electronic entertainment, I have no idea how this animation fits in with the game, whether it adapts it, complements it or is a sequel to it. However that knowledge does explain the way the anime is structured, as its regimented and formulaic storytelling style very much has the smell of videogame origins about it. This more than anything is a major flaw in the show, one that some might consider fatal. Once I got used to it however, I did manage to eke some entertainment out of Danganronpa. It’s not just a dystopian death game in the vein of Battle Royale or Incite Mill, although a key element of the show is the fifteen students trapped in high school with a psychopathic robot bear, and compelled to kill each other in the hope of escaping their predicament. 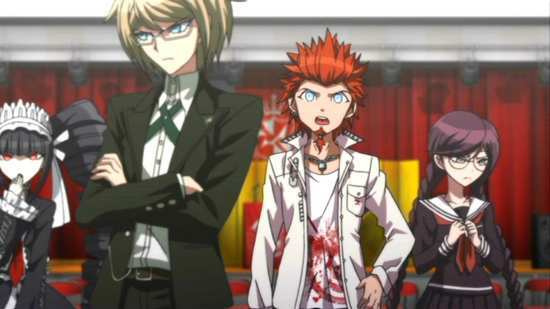 But the game elements of Danganronpa also include investigation of crimes and trials of the accused. That results in the (Not) and Not repetition in the episode titles. The (Not) episodes usually comprise character moments, some goofing around, some testing of the limits of their prison, before a corpse is found, one of their number. 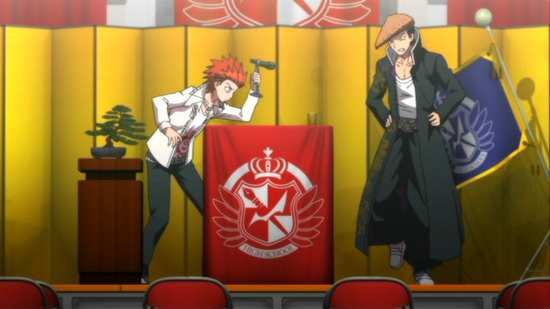 The Not episode immediately after will show the survivors investigating the crime, before Monokuma calls the students to order to debate the crime and determine the guilty party, before said guilty party is despatched in a novel and graphic execution sequence. It’s the formula that is the undoing of Danganronpa. There’s not enough time to get to know the characters, or the characters to get to know each other, especially at first where there are 16 of them including the bear, and you don’t even get to know some of their names before they depart this mortal coil. It’s only towards the midpoint of the series that they’ve been whittled down enough to get enough screen time, and develop their relationships. The investigations too are just highlights packages, investigation montages, and if you’re watching the show to play along with these obnoxious teen Columbos as they seek out the murderers, then you’ll never get the clues or the time to figure them out either. The same goes for the trials, which are over almost as soon as they begin. Danganronpa’s one saving grace is the characterisations, although it’s more appropriate to call them archetypes, caricatures even. The students are presented as the ultimate in their fields, the super high school level detective, the swimmer, the wrestler, the biker, the fortune-teller, the idol and so on. Not only in physical appearance, but in performance too are the characters pushed to the bounds of credibility. They’re ridiculously over the top, but in the world of Danganronpa, any kind of subtlety would be misplaced. Although I do have to wonder how any psychotic Japanese female mass-murderer can speak without biting her tongue off, or without drool dripping. 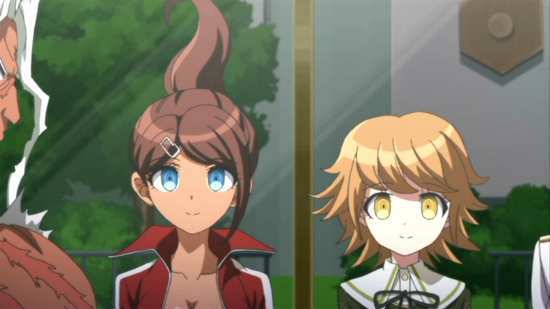 It’s the insanity of the characters that hits with the impact of Naegi’s verbal bullets (the show has some daft visual ideas and it runs with them), and it alone makes you keep watching right to the end, however much the show’s structure serves to disappoint. The ending might be a bit of a letdown too, with a wholly contrived series villain, and as per usual for anime these days, it leaves on an open note that obviously hopes for a sequel. 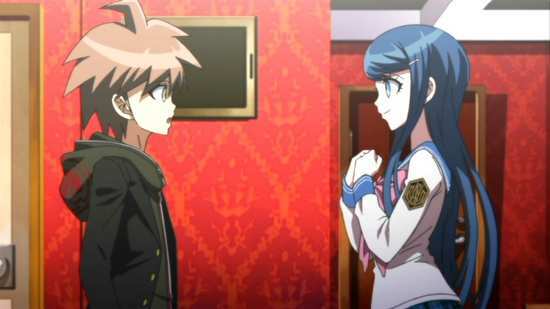 Danganronpa is entertaining, and it’s memorable too, but its narrative flaws, too obviously restricted by the structure of the game that it’s based on, almost outweigh all that is good about the show. The show’s visuals demand an HD presentation, but this DVD release is good enough to watch.